November 13, 1978 – We fly from Charlotte, N.C., the last stop on a Fall promotion tour on behalf of our Berenstain Bears books to meet with a leading animation producer / director. Object: to try to persuade him to produce a Christmas special about our eponymous bears. He is tanned, gracious and charming, and assures us that Christmas is a waste of time. The networks have so much Christmas stuff that it’s almost impossible to get a Christmas special on. He suggests that a less competitive holiday would be more appropriate for our bears – Father’s Day, for instance. He shows us some character sheets for animated specials he has on this Christmas. November 14 – We ponder less competitive holidays – Father’s Day, Columbus Day, Arbor Day (the bears live in a tree), but visions of sugar plums persist on dancing in our heads. November 15 – We get back to the real world of writing and drawing Bear books and contributing our long-running “It’s All in the Family” (people) feature to Good Housekeeping. November 19 – As we work on The Berenstain Bears’ Activity Book, the twenty-fourth Bear book in our series, we continue to hear strains of Jingle Bells and Deck-the-Halls in our collective heads. A Christmas story line begins to generate. We see funny overconfident Papa and his bright helpful little cubs off in the woods. Papa’s carrying his trusty ax. Where’s Mama? December 5 – The Christmas specials season kicks off. The tanned Hollywood producer is right. The networks have animated specials coming out of their ears – there’s Snoopy, The Grinch, Rudolph, Frosty the Snowman – Christmas specials as far as the eye can see. There is no room on the networks for our bears. December 14 – Since Christmas specials tend to come in bunches we catch some non-animated Christmas shows — a beautiful musical presentation from the First Baptist Church of Dallas starring Tennessee Ernie Ford, a wonderful Gift of the Magi. The credits indicate they are produced by The Cates Brothers. We had some dealings with Joe Cates some years ago on a non-bear project that never got out of the woods. Well, somebody’s getting Christmas shows on the air. December 22 – We are in New York seeing our publisher. On the way home we stop at a newsstand, but instead of picking up our usual couple of magazines, something impels us to buy Variety, the show biz weekly. We are startled to find among the arcane headlines about “Boff Grosses” a large Cates Brothers ad announcing their five new Christmas specials. December 27 – We write Joe Cates seeking his advice. He may not do animation, but he sure does Christmas specials. Perhaps he could advise us. A short meeting. A few minutes of his time. Wouldn’t even have to be in his office. Could be in an anteroom, a hallway. January 15, 1979 – We don’t hear from Cates. January 30 – We still don’t hear. February 7 – We still don’t hear. We forget about television. February 20 – April 8 – A great deal happens over the next few months. 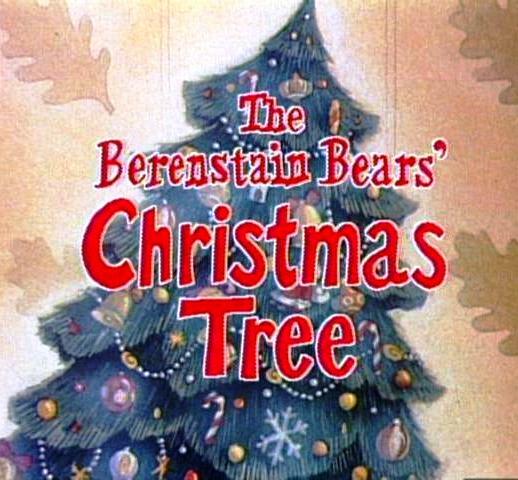 We write the script and song lyrics for The Berenstain Bears Christmas Tree. Arrangements are made with Perpetual Motion Pictures, a leading producer of animated commercials, to create the film. Perpetual’s prexy, Buzz Potamkin tells us how many individual animation drawings it will take to produce the film. We faint. (20,000 drawings!). Director Mordi Gerstein tells us he will need model drawings of the bears — front, side and back views — and of the other characters as well. We draw perpetually for three weeks. Back views of the bears are especially challenging (we’ve never seen them from the back before). Emmy award-winning conductor/composer Elliot Lawrence performs the music he has composed on a tinny piano in a raspy voice. It’s beautiful. We worry about how Mordi and his animation group will draw our bears. Will they come out looking like the Michelin Man or the Hawaiian Punch person? Associate producer Jere Jacob reassures us on this and many other scores. “Not to worry. They are great bear drawers.” She’s right, on this and many other scores. Auditioning voices: we listen to eight Papas, six Mamas and four-and-twenty Sister and Brother Bears in six hours. Actors are selected. Two days in the space station atmosphere of a high-powered sound recording studio: sound engineer Bob Lifton laughs at two of the show’s ninety-seven jokes. Since he does sound for Saturday Night Live this is considered a good omen. November 10 – Somehow the thousands of drawings, the myriad vocal and musical effects it takes to make one twenty-six-and-a-half minute animated special have come together — and The Berenstain Bears’ Christmas Tree is done … If you want to find out how the bears discover the true spirit of Christmas (after running afoul of an angry skunk, a roaring blizzard and an ax-wielding eagle), just tune in and see “’how Christmasy” it all turned out. Loved this! Such a great encouragement to never, ever give up! This is one of the best shows on tv. Great moral values!!! Thanks so much! For the first foray onto the TV medium, this special went over perfect in translating the fabulous illustrations to animation and the memorable music greatly distinguished it well from the rest I feel (at least by 1979 standards). Looking back, it is pretty interesting to see how a small animation house mostly relegated to doing advertising or station ID inserts could lend themselves well to carrying on for 26 1/2 minutes at once but they did, and it shows on every frame. Use to enjoy these specials when they first aired or repeated themselves on NBC back then, personally I enjoyed the final special produced in ’83, a sort of non-Holiday-specific entry called “The Berenstain Bears Play Ball”. of course I came from that era when I was reading those books a lot and it was a thrill to see them finally on TV where their world could be expanded upon through animation, of course the Saturday morning series would continue that further, though I don’t remember seeing it as much (either I was watching something else at the time it aired or the local affiliate chose to dump the show in favor of something else like Wild Kingdom). Thanks for your perceptive comments. By the way, my father, Stan, continued to have a close relationship with Buzz Potamkin long after the CBS show. They were in frequent touch by phone and worked together trying to develop a Berenstain Bears feature film and other animation projects though none of these got very far. I was very saddened to learn of Buzz’s death a while back. He was a very distinguished animation professional and a genuinely nice guy. I’m so glad this came together. This is one of our favorites that we watch every year at Christmas. 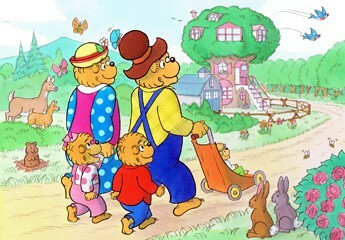 We have many of the other Berenstain bears DVDs too. I grew up reading the books and now my children and I read them together. We love them!